Water Pump Kit Mercruiser 46-807151A14, 18-3150 Bravo. Check to make sure it fits your application. GM 305 V-8 1987 0B525982 THRU 0B774444 (MERCRUISER). GM 305 V-8 1987 0B525982 THRU 0B773739 (MERCRUISER). 260 GM 350 V-8 1987 0B525982 THRU 0B773304 (MERCRUISER). 350 MAG MPI ALPHA/BRAVO 0L010019 THRU 0L339999 (MERCRUISER). 350 MAG MPI ALPHA/BRAVO 0L331599 THRU 0M299999 (MERCRUISER). 350 MAG MPI HORIZON MIE 0L302200 THRU 0M299999 (MERCRUISER). 350 MAG MPI MIE 0L302200 THRU 0M299999 (MERCRUISER). 350 MAG MPI SKI (GEN Plus) GM 350 V-8 1998 AND UP 0L002600 THRU 0M310009 (MERCRUISER). ALPHA EFI(GEN Plus) GM 350 V-8 1996 0F800300 THRU 0K001508 (MERCRUISER). MPI MIE (GEN Plus) GM 350 V-8 1998 0L002008 THRU 0L302199 (MERCRUISER). 357 Alpha 4V 1G400000 & Up (MERCRUISER). 357 Mag Bravo 4V 1G400000 & Up (MERCRUISER). 383 Mag Bravo 4V 1G480748 & Up (MERCRUISER). 383 Mag Inboard 4V 1G400000 & Up (MERCRUISER). 4.3L (GEN Plus) 2 BBL. GM 262 V-6 1998 0L010044 THRU 0M614999 (MERCRUISER). 4.3L CARB ALPHA/BRAVO 0M615000 THRU 0W300012 (MERCRUISER). 4.3L CARB ALPHA/BRAVO 0W300013 THRU 0W309999 (MERCRUISER). 4.3L CARB ALPHA/BRAVO 0W310000 THRU 0W649999 (MERCRUISER). 4.3L CARB ALPHA/BRAVO 0W650000 THRU 1A063239 (MERCRUISER). 4.3L CARB ALPHA/BRAVO 1A063240 & Up (MERCRUISER). 4.3L EFI (GEN Plus) TBI GM 262 V-6 0L012009 THRU 0L618999 (MERCRUISER). 4.3L EFI (GEN Plus) TBI GM 262 V-6 0L619000 THRU 0M322780 (MERCRUISER). 4.3LH (GEN Plus) 4 BBL. 454 MAG MPI BRAVO (GEN VI) GM 454 V-8 1998 0L010029 THRU 0L058399 (MERCRUISER). MPI BRAVO (GEN VI) GM 454 V-8 0L085400 THRU 0M024999 (MERCRUISER). VI GM 454 V-8 0L002200 THRU 0L086049 (MERCRUISER). VI GM 454 V-8 0L086050 THRU 0L674000 (MERCRUISER). 5.0L CARB ALPHA/BRAVO 0M600000 THRU 0W300009 (MERCRUISER). 5.0L CARB ALPHA/BRAVO 0W300010 THRU 0W309999 (MERCRUISER). 5.0L CARB ALPHA/BRAVO 0W310000 THRU 0W649999 (MERCRUISER). 5.0L CARB ALPHA/BRAVO 0W650000 & Up (MERCRUISER). 5.0L EFI GM 305 V-8 1998 0L012052 THRU 0L339999 (MERCRUISER). 5.7L ALPHA EFI (TBI) GM 350 V-8 1995 0F355305 THRU 0F752389 (MERCRUISER). 5.7L BRAVO EFI (TBI) GM 350 V-8 1995 0F225560 THRU 0F752399 (MERCRUISER). 5.7L CARB ALPHA/BRAVO 0M600000 THRU 0W300754 (MERCRUISER). 5.7L CARB ALPHA/BRAVO 0W300755 THRU 0W309999 (MERCRUISER). 5.7L CARB ALPHA/BRAVO 0W310000 THRU 0W649999 (MERCRUISER). 5.7L CARB ALPHA/BRAVO 0W650000 & Up (MERCRUISER). 5.7L CARB MIE 0L002003 THRU OM316999 (MERCRUISER). 5.7L CARB MIE 0M317000 THRU 0W090899 (MERCRUISER). 5.7L CARB MIE 0W090900 THRU 0W689999 (MERCRUISER). 5.7L CARB MIE 0W690000 & Up (MERCRUISER). 5.7L CARB SKI 0M317000 THRU 0W090899 (MERCRUISER). 5.7L CARB SKI 0W090900 THRU 0W689999 (MERCRUISER). 5.7L CARB SKI 0W694844 & Up (MERCRUISER). 5.7L COMPETITION SKI (GEN Plus) GM 350 V-8 1998 0L002005 THRU 0M316999 (MERCRUISER). 5.7L EFI 2 BBL. TBI GM 350 V-8 1996 0F752400 THRU 0K001505 (MERCRUISER). 5.7L EFI GM 350 V-8 1998 0L010035 THRU 0L339999 (MERCRUISER). 5.7LX BRAVO EFI (GEN Plus) GM 350 V-8 1996 0F800300 THRU 0K001508 (MERCRUISER). 5.7LX EFI 4 BBL. Plus GM 502 V-8 1999 0L414639 THRU 0L601036 (RACE STERNDRIVE). 500 EFI 0L001496 THRU 0L306499 (RACE STERNDRIVE). 500 EFI 0L306500 THRU 0L307027 (RACE STERNDRIVE). 500 EFI 0L307028 THRU 0L602036 (RACE STERNDRIVE). 500 EFI 0M050001 THRU 0M050853 (RACE STERNDRIVE). 500 EFI 0M052001 THRU 0M053628 (RACE STERNDRIVE). 500 EFI 0M900064 THRU 0M901284 (RACE STERNDRIVE). 500 EFI 0M905089 THRU 0M907127 (RACE STERNDRIVE). 502 MAG MPI BRAVO (GEN VI) GM 502 V-8 1998 0L017000 THRU 0L085432 (MERCRUISER). MPI BRAVO (GEN VI) GM 502 V-8 0L085433 THRU 0M024999 (MERCRUISER). 525 EFI 0M900146 THRU 0M953619 (RACE STERNDRIVE). 525 EFI 0M953620 THRU 0M956326 (RACE STERNDRIVE). 525 EFI 0M956327 THRU 0M962885 (RACE STERNDRIVE). 525 EFI 0M962886 & Up (RACE STERNDRIVE). 540 Stroker 4V 1G400000 & Up (MERCRUISER). 565 EFI 0M967821 & Up (RACE STERNDRIVE). 575 SCi 0L306696 THRU 0L307026 (RACE STERNDRIVE). 575 SCi 0L601000 THRU 0L602090 (RACE STERNDRIVE). 575 SCi 0M050000 THRU 0M053292 (RACE STERNDRIVE). 575 SCi 0M900000 THRU 0M950526 (RACE STERNDRIVE). 600 SCi 0M952908 THRU 0M962885 (RACE STERNDRIVE). 600 SCi 0M962886 & Up (RACE STERNDRIVE). 662 SCi 0M956580 THRU 0M962885 (RACE STERNDRIVE). 662 SCi 0M962886 & Up (RACE STERNDRIVE). 7.4L BRAVO (MPI)GEN. 7.4L MIE MPI (LH) GEN. 7.4L MPI MIE (L29) GEN. 7.4L TBI MIE (LH) GEN.
700 SCi 0M954560 THRU 0M962885 (RACE STERNDRIVE). 700 SCi 0M962886 & Up (RACE STERNDRIVE). 8.2L MIE MPI GEN. VI GM 502 V-8 0L002450 THRU 0L086012 (MERCRUISER). VI GM 502 V-8 0L086013 THRU 0L674200 (MERCRUISER). 8.2L MIE MPI (LH) GEN.
MX 6.2L MPI BRAVO 0L680003 THRU 0M299999 (MERCRUISER). MX 6.2L MPI MIE 0L302200 THRU 0M299999 (MERCRUISER). Scorpion 377 0K000656 THRU 0L600314 (RACE STERNDRIVE). Scorpion 377 Sterndrive 0L416146 THRU 0M907201 (RACE STERNDRIVE). Made to meet or exceed OE specifications in quality and performance All impellers are made from nitryl or neoprene rubber compounds. Extensive inspection and testing on each impeller batch insures proper bonding and performance. Sierra products are engineered to meet today's high horsepower engine demands and stand up in the harsh marine environment. All Sierra products meet or exceed the original equipment part it replaces. Sierra supplies many OEM engine manufacturers and boat builders hundreds of quality parts every day. WE HAVE YOUR GEAR FOR EVERY TIME OF THE YEAR. 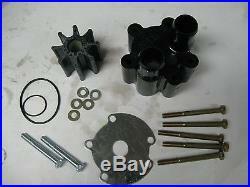 The item "Water Pump Kit Mercruiser 200 230 260 350 357 383 4.3L 454 5.0L 5.7L 500 502 525" is in sale since Friday, August 30, 2013. This item is in the category "eBay Motors\Parts & Accessories\Boat Parts\Accessories & Gear\Covers". The seller is "blackfootmotorsports" and is located in Blackfoot, Idaho. This item can be shipped worldwide.